The Karaf team is pleased to announce the availability of Apache Karaf 2.2.0. This release of Apache Karaf contains a multitude of new features, improvements, and bug fixes. Some highlights include many new or updated commands, a LDAP JAAS module with login support, an updated feature service, a feature for Aries transaction, JPA & JNDI modules, expanded documentation, and new versions of most dependencies. The help system and manual have also undergone major updates. Please note that if you are using pax-exam with scanFeatures that you also have to upgrade pax-exam to the latest version. For more detail please see the change log. The Winter 2011 CS Singles Programming Competition took place at Memorial University last night. Fourteen students registered for their opportunity to try their algorithmic skills on three problems developed by the Mun Programming Competition committee. The night started off to a unique challenge as the power to the light system was shutdown. I'm not sure if any of the students really noticed this however as they focused in on solving their problems. After thirty minutes the power was restored, and the competition got into full swing. 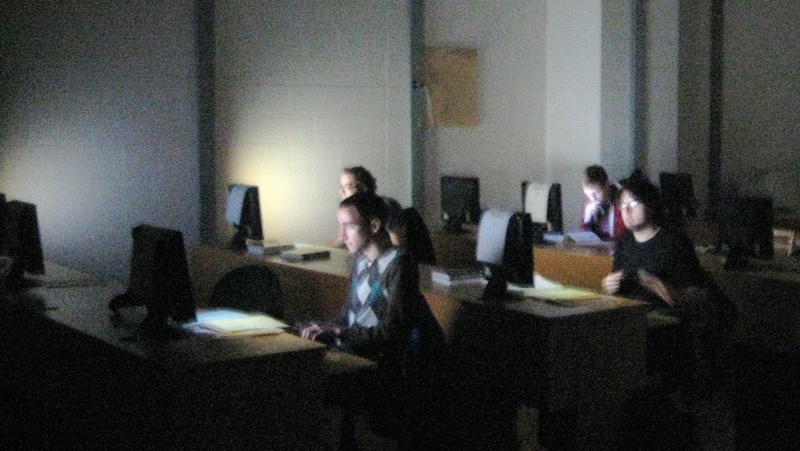 The lab room was uncharacteristically quiet for the entire evening, with the students barely breaking for a slice of pizza, a cookie or a drink. Two hours later the regulation competition time was over and we were able to announce our winners. Our games sponsors then took center stage to present our top placements with their prize packages. Left to Right: Steven Taylor, Ken Collingwood. The third place prize was presented by IDBlue's Steven Taylor to Ken Collingwood. Left to Right: Eric Davidson, Robert Hamilton. 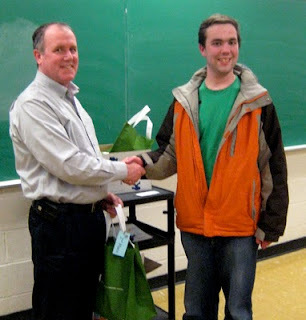 The second place prize was presented by Pathfinder/Nomadica's Eric Davidson to Robert Hamilton. 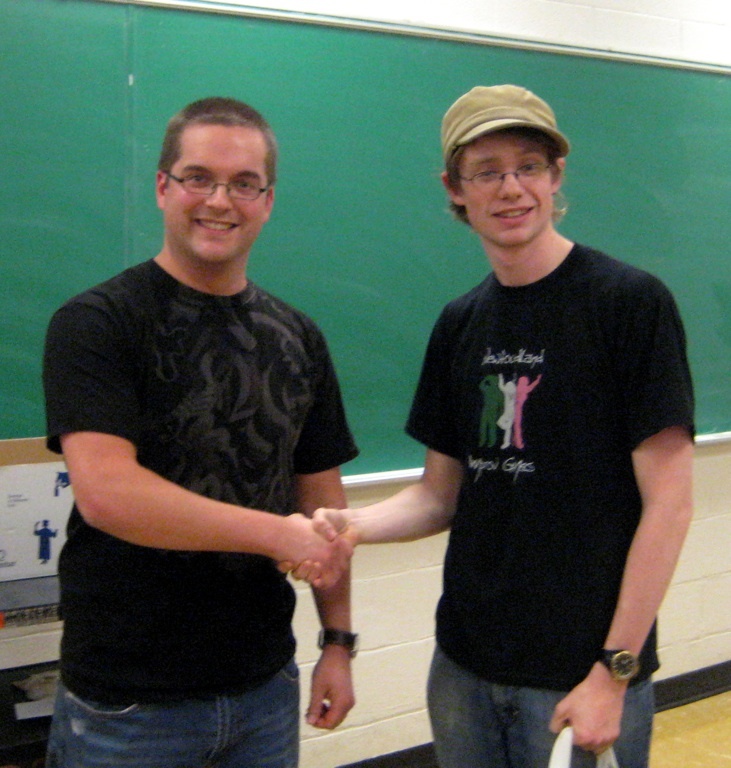 Left to Right: Jon Anstey, Robert Robere. 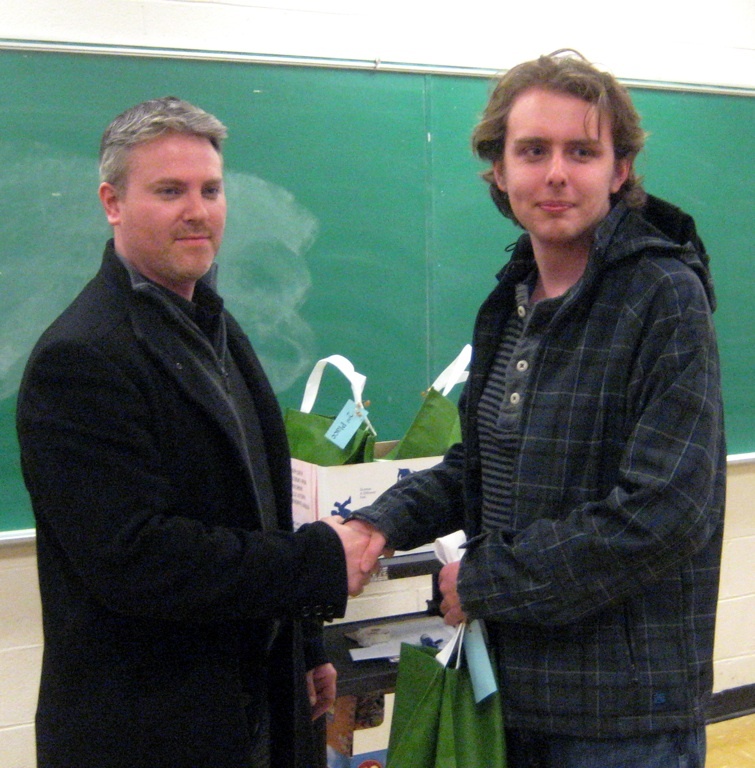 And finally the first place prize was presented by FuseSource's Jon Anstey to Robert Robere. I'd like to thank all the students, volunteers, sponsors, and the games committee again for making these CS games possible. I hope to see everyone again in three weeks time when we have the pairs competition. Mun CS Games Winter 2011 Singles Competition! 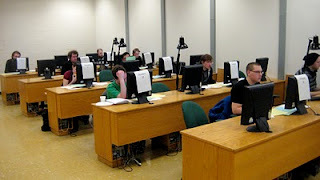 Each Fall and Winter at Memorial University's Computer Science Department an ACM rules programming competition is held for their students. In the spring of 2010 I attempted to boost student interest by providing some prizes, this went over very well for all involved. Last Fall I continued the gesture, and this Winter continue it again. The second place prize is being sponsored by Nomadica Group. The prize pack consists a copy of IEEE Spectrum magazine, a copy of Challenges for Game Designers, a copy of Project Management Secrets, a DVD of the movie War Games, a Mun water bottle, a Mun market bag, and a Mun pen. The first place prize is sponsored by Jon Anstey. This prize pack consists of a copy of Camel in Action (personally auto graphed by the co-author himself! ), a Mun water bottle, a Mun market bag, and a Mun pen. Some lucky runners up will receive a loot bag containing a Mun pen and chips - yes bags of chips! We are that awesome!!! The Winter 2011 CS Games (Singles) are tentatively scheduled for February 25th, 2011, in room EN2036 at 5pm to 7:30pm. There is a sign up sheet in the CS department head office, please contact them if your interested in competing - seats are limited (CS students only). When a link to the information regarding competition rules, and other details becomes available I'll update this post. After several attempts trying to get the new Scalate based web site to update, the Karaf team is pleased to announce the availability of Apache Karaf 2.1.4. This release of Apache Karaf is based off of the 2.1.x series branch, representing an update to Apache Karaf 2.1.3. It contains several bug fixes identified in the prior release, and introduces several improvements including; better behavior of the features-maven-plugin, documentation for making multiple configuration files available to the bundle context, and a more efficient bundle description for header display. It's Friday night; Are you pondering what I'm pondering? Pinky: Uh, I think so, Brain, but why would I pour a bottle of wine into the Computer? Well it IS Friday night and I am here pondering getting the Apache Karaf 2.1.4 release candidate process going. There has been a number of updates to the Karaf infrastructure so lets review them before we dive into the release candidate fun! First off, the main Karaf web site is now powered by Scalate. This means that instead of editing a wiki page in place then saving it to publish, we now check out the site source code, edit and review it (in our editor of choice), then deploy it to website. See the 'how do I edit the website' page for more details. Finally, we've added to the Hudson build profile a Karaf view. This simplifies the process of finding out the current build status of Apache Karaf's various versions. Now that the above has been discussed, lets look at some changes to the Apache Karaf Release Guide. There have been two recent additions to the guide; the first regarding community awareness, and the second on publishing the Karaf manual. To help communicate with the Karaf community more effectively we have established a procedure that we hope will help keep users & developers aware of new branches being created, and their status as they go towards a release. Generally these things are discussed on the project IRC channel, however that is not prominent enough to reach the whole community, so we'll now send out update or notice emails to our user/dev lists. Now that we're moved to a Scalate based web site we now have a new procedure for generating our manual. This new system should help us improve the quality of our documentation by linking the manual to Karaf versions instead of packaging the old wiki's manual pages. Please note that this takes affect for Karaf version 2.2.x and higher.